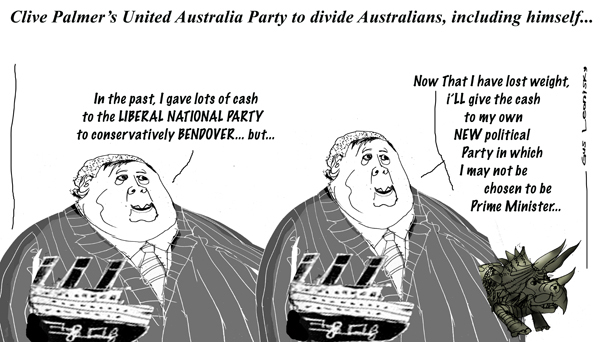 A FLEDGLING political party may have scuttled the hopes of Queensland's richest man Clive Palmer of creating an alternative political outfit under the name "United Australia Party". Mr Palmer told ABC TV on Thursday he was re-forming the United Australia Party (UAP), which was dissolved in 1945, and had applied for registration in Queensland. "I definitely will be (personally) standing for federal parliament," he confirmed, without revealing which seat. "I definitely will be running in a seat in Queensland, but it would be presumptuous of me (to say which one). "Like any political party, it's got to have its own preselections. By the end of next week we'll be announcing some of our candidates for federal parliament." Mr Palmer has promised to crush an attempt by the "Uniting Australia Party" to register with the Australian Electoral Commission and has until May 24 to dispute its claim to the similar-sounding name. Billionaire mining tycoon Clive Palmer has announced he will stand for a Queensland federal seat in September's election, declaring he wants to be elected prime minister. The flamboyant businessman - who is also behind a plan to build a replica of the Titanic cruise ship - floated his latest idea at a Brisbane news conference today. He said his new United Australia Party would contest every seat across the country, but so far he is the only candidate. We instead crave intellectual combat between Kevin Rudd, Malcolm Turnbull, Julian Assange, Bob Katter and Clive Palmer. It is time we truly had a contest of ideas and ideals. Democracy is well defined as Government by, for and of the People. Alas, in Australia, it is nothing more than faecal residue; the waste product of Government by, for and of the political parties, and their lobbyists and spin doctors. We, the People, need to reclaim our country and our Parliament. We should not be made to feel we are mere tenants in our own Houses of Parliament. We are not. We are landlords and landladies of this Great Southern Land, Terra Australis. Unlike our politicians, we are not absentee landowners. Mining magnate Clive Palmer says police are investigating a burglary at his company's Brisbane headquarters overnight. He says a computer was stolen, along with corporate and financial records. Mr Palmer says he believes the incident is linked to his recent decision to contest the September federal election with the United Australia Party. "I had a telephone call from our financial adviser Michael Dahl who said there'd been a break-in to our financial section, that his computer had been stolen and other items had been stolen and been gone through, which I can't go through," he said. "The police are now investigating. "Of course this could have been a coincidence. THE richest man in Queensland says he would be content with a life where he only slept in one bed, ate a single meal each day and spent his time with "one woman". Billionaire Clive Palmer – who owns a super yacht, a fleet of aircraft, dozens of cars, and multiple mansions - this morning told reporters he would be content with living the simple life. “When it comes to me, I don’t care if I’ve got nothing – I’m happy to sleep in one bed, eat one meal a day and be with one woman,” he said. “I don’t care if I lose everything I’ve got… all I care about is serving the Australian people." Mr Palmer made the comments at a press conference announcing former state MP Rob Messenger will contest the seat of Hinkler as a member of the United Australia Party. At the press conference, Mr Palmer continued to dodge questions over how he planned to retrospectively dismantle the carbon tax and what he would do should his party fail to become registered with the AEC. Asked whether he was serious, Palmer said "yes, I get ridiculed all the time (about my political ambitions)". Palmer, who launched his United Australia Party last week, says he is confident that he will be Australia's next prime minister. He said three opinion polls in the last week which showed strong support for him had his opponents "shitting themselves". Asked whether that included Federal Opposition Leader, Tony Abbott, Palmer said "you'll have to ask him, but he's going to have a lot of time after the election to go cycling". Mining billionaire and Palmer United Party founder Clive Palmer says The Australian has printed information that was stolen from his Brisbane office. The national newspaper is reporting that Mr Palmer has warned a Chinese company that 1,000 jobs will be at at risk if it does not pay money it owes him. Mr Palmer says a laptop was stolen in April, and his computers were hacked. "Some of the information that was produced in some of these articles, although taken out of context, was confidential secure information, the property of the company," he said. "It's a concern that it's now got into the media hands, and all of this happened only one or two days after we announced the party. It seems to be a little bit of a coincidence." Mr Palmer says he is not suggesting the newspaper stole the information. Premier Campbell Newman has asked Clive Palmer to "guarantee" jobs at his Townsville nickel refinery and Sunshine Coast resort. But Mr Palmer has hit back by saying he would "undertake a commitment to all jobs at Queensland Nickel" if Mr Newman would "reinstate the 14,000 jobs that he dismissed". "The people of Townsville and the company know of my strong personal commitment to them and their families,'' Mr Palmer said. “I don’t need to respond to Campbell Newman who has continually misled the people of Queensland. “He’s been selling Queensland assets via sweetheart deals his lobbyist mates which aren’t in the best interests of Queenslanders." The Australian already runs plenty of vendettas against the Greens, the ABC, the NBN, climate science, the Fairfax press and of course the Labor government and the independents who support it, to name but the most obvious. But it is a surprise to find the mining magnate Clive Palmer suddenly heading the paper’s hate list because while most of its usual targets are supported by the left, or suspected of veering that way, Palmer is defiantly to the right of the soup spoon. Indeed, in the past he has been one of the paper’s favourites: when Treasurer Wayne Swan attacked Palmer and his fellow miners Gina Rinehart and Andrew Forrest for misusing their wealth and power, the Australian defended them vigorously as risk takers, entrepreneurs, the saviours of the economy. But that was when Palmer was still a loyal bagman for the Coalition. Now he has defected to found his own Palmer United Party, which will be a new conservative rival and could even cost Tony Abbott seats in Queensland. So the sledgehammer has been brought out to crush Palmer’s nuts. Actually the attack has been less on the PUP and its policies than on its leader and his businesses, but what the muckrakers have lacked in substance they have more than made up in sheer volume. Last Friday, for instance, there was a front page story spilling to page 4, where two separate diatribes could be found. And in the weekend paper the front page story spilled to page 6 with another two servings of vitriol; and the whole of page 17 was taken up by two lengthy features about the evils of Palmer. Palmer bashing took up almost all of the sneer-and-smear column Cut and Paste and just in case anyone missed the point, there was an editorial explaining why the paper had a duty to kick him to death. “In the public interest the scrutiny will continue,” it concluded sanctimoniously. And indeed it has; there was another swing on Monday. It must all be a bit bewildering to the readers, and indeed to Palmer himself, but perhaps he is not too unhappy about the attention. Until the Australian’s blitzkrieg, he and his party tended to be figures of fun, not taken too seriously. But if our national daily regards them as matters of such crucial importance perhaps the voters ought to sit up and take notice. Prime Minister Tony Abbott has accused Clive Palmer of trying to "buy seats" in the Senate in this Saturday's re-run election in Western Australia. The Palmer United Party (PUP) has spent a substantial amount of money on advertising in the lead-up to the vote, with some reports it has spent up to 10 times more than the major parties. PUP is hoping to win a third Senate spot, in addition to the seats it already holds - one each in Queensland and Tasmania. But Mr Abbott says Mr Palmer cannot be taken seriously. "I don't believe that the people of Western Australia are going to put seats in the national Parliament up for sale, which is effectively what someone is trying to do," he said.